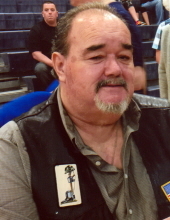 Celebrating the life of Victor Lee Turk Sr.
Obituary for Victor Lee Turk Sr.
Age 70 of Owosso passed away Wednesday, April 10, 2019 at Memorial Healthcare. A funeral service will be held 2 pm Saturday, April 13, 2019, at Nelson-House Funeral Home with Pastor Mike Case officiating. Burial will follow at Pine Tree Cemetery, Corunna. The family will receive friends at Nelson-House Funeral Home on Friday from 2 pm to 8 pm. Victor was the son of Thomas J. and Neva (Castle) Turk born in Owosso on July 19, 1948. Victor graduated from Corunna High School, Class of 1967. He married Kathy Jean Matthews in Corunna on May 25, 1969; she predeceased him on February 11, 2015. Victor proudly served his country in the United States Army. He worked as a welder at Woodard Furniture for 15 years. He was a member of Owosso VFW #9455. He enjoyed watching his kids sports and activities and loving on the grandkids. He also enjoyed trips to the casino, fishing and dune buggy's at Silver Lake. Victor is survived by his children, Victor (Texanne) Turk Jr., Latrelle (Jerry) Hayden and Betty (Abe) Burdick. Grandchildren, Sierra, Dalton, Kenzie, Austin, Ryley, Brendan and Damon and 2 great grandchildren, Ariella and Ava; brothers, Tom (Katheen) Turk, Art (Alma) Turk; sister, Lilly Turk (Doug Holzsalander); many other loving family and friends. He was predeceased by his wife, Kathy; parents; sister, Grace Turk and brothers, John Turk and Edward Turk. To send flowers or a remembrance gift to the family of Victor Lee Turk Sr., please visit our Tribute Store. "Email Address" would like to share the life celebration of Victor Lee Turk Sr.. Click on the "link" to go to share a favorite memory or leave a condolence message for the family.